WITH REGRET we report the death of BASIL JAMIESON, a long time member of the League and the North Otago Branch, on 7 July at the age of 88. Peter Grenfell writes “Basil had lived in Kakanui (iust south of Oamaru) for about 36 years. He had a lifelong career in education, except tor Army service overseas in Egypt, Italy and then with J Force in the occupation of Japan. 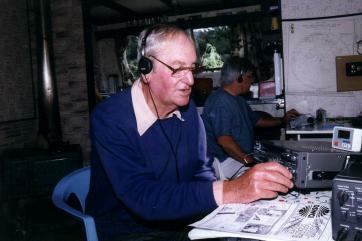 He was one of the early members of the Citizens Band Radio Club and then became a member of the League’s North Otago Branch where he held various positions. With his educational background, knowledge and wisdom, Basil was a valued member who was always willing to help new and younger members learn about the complexities of the hobby of Radio DXing. And from Arthur de Maine; “I first met Basil in I983/84 when I ventured south to the AGM at Oamaru and Peter Grenfell took me out to Kakanui to visit Basil. When we moved to Kakanui in 2002 I found that we were only two streets away from Basil. I would often walk around to his place to find that he was not home but away driving around North Otago or further afield. I sat beside Basil throughout our time at Dunedin Training College. I got a nice reply from him in 2006, but just now have read your tribute at the time of his death. So sorry, as he was a great companion.